Stepping into such an exquisite masterpiece, it's hard to believe the Yu Garden nearly met its demise on several occasions. At the end of April 2016, a Dunedin Chinese Garden delegation visited our sister garden, the famous Classical Yu Garden in Shanghai. With winding corridors, zig zag bridges and the soothing rustle of bamboo, it was easy to feel at home in a Garden with over 400 years of history. 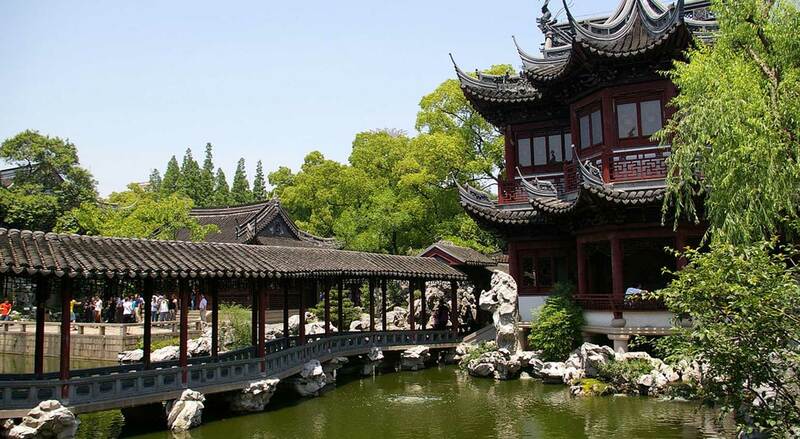 Built during the Ming dynasty in the 1500's, government official Pan Yunduan envisioned the garden to be a place of dwelling and rest for his parents as they entered the later years of their life. Shortly after the initial design concept however, Pan was appointed governor of Sichuan and construction was halted for the next 20 years. Unfortunately, this meant that Pan's parents weren't able to make full use of Yu Yuan until much later than intended and as their quality of life declined, so did the state and upkeep of the garden. What was once a place of prestige and grandeur and the most expansive garden in Shanghai during its era, quickly turned into an expensive state of affairs. Over the next 400 years, Yu Yuan was met with dereliction and destruction and underwent several ownerships and reconstruction projects, during which, it often served as a private entertainment venue. Detrimental misuse of the Garden, however, occurred during the First Opium War (1839-1842) when parts of Yu Yuan became the base for British troops. Not long after, again Yu Yuan was caught amidst a battle and was occupied by the Small Swords Society during the Taiping Rebellion. Both instances caused untold and in some cases irreparable damage to buildings and the surrounds of the Garden. Finally, against all odds and many more intensive restoration projects, Yu Yuan could live up to its name of being a peaceful and carefree place when it was officially opened to the public in 1961. Unfortunately, the 21st century Yu Yuan is somewhat different to the original 16th century design as many buildings were never recovered and additions and expansions were made from owner to owner. However, it remains a remarkable feat that Yu Yuan exists to this day and it certainly hasn't lost its sense of grandeur and awe. Visit Yu Yuan Garden's website. In March 2010 we signed a Sister Garden Agreement with Yu Yuan – we are to be their first and only “Sister”. As they tell us, “we have many friends but only one sister.” The Agreement is designed to be worthwhile for both Gardens with the giving and receiving of staff exchanges to promote cultural understanding and knowledge. In October 2011 the Director of the Yu garden, Ling Zang visited for the first time, gifting the Garden a magnificent vase, which is proudly on display.